There are many diseases that are prevalent in the world, and some diseases even more so in the United States. Diabetes and heart disease are diseases that are becoming more and more common to this country’s population. However, there is another disease that does not get nearly as much attention that not only affects almost half of all adult Americans but also can have a significant impact on other diseases, including forementioned diabetes and heart disease. This disease is the irreversible oral condition known as periodontal disease. When plaque accumulates on tooth surfaces and is not effectively removed, gingivitis occurs. If gingivitis is not treated and reversed, it can advance into periodontitis. Periodontitis cannot be reversed, only maintained. Periodontitis itself means inflammation around the tooth. In periodontitis, gums pull away from the teeth and form spaces called “pockets” that become infected with bacteria that produce endotoxins. The body’s immune system fights the bacteria as the plaque spreads and grows below the gum line. Endotoxins and the body’s natural response to infection start to break down the bone and connective tissue that hold teeth in place. If not treated, the bones, gums, and tissue that support the teeth are destroyed. The teeth may eventually become mobile and fall out naturally or need to be extracted1. Unfortunately, periodontal disease is a prevalent condition that affects 47.2% of Americans age thirty and older2. The prevalence of this disease makes it all that more important to understand the relationship it can have on one’s overall health, as well as the relationship it shares with other life-threatening conditions such as diabetes and heart disease. 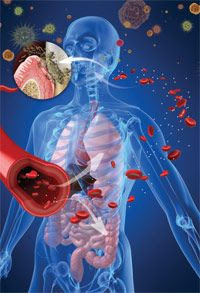 It has been established that in individuals with diabetes, there is about a three times higher risk of periodontitis3. This is because hyperglycemia caused by diabetes mellitus can alter the immune system in many ways. It increases the salivary concentration of glucose as well as its concentration in the gingival crevicular fluid. This increased availability of glucose in the oral cavity environment increases proliferation of the bacteria associated with periodontal disease. Furthermore, the presence of elevated levels of inflammatory mediators in the diabetic crevicular fluid results in significant periodontal destruction4-6. Thus, diabetes is considered to be a predisposing factor for periodontitis3. On the other side of the equation, lipopolysaccharides from periopathogenic gram-negative bacteria are able to induce tumor necrosis factor-alpha production by monocytes and macrophages. This cytokine can interfere with lipid metabolism, reduce glucose uptake by cells, and cause insulin resistance7. This seems to confirm that diabetes and periodontal disease have a bidirectional relationship. Heart disease is also an extremely important condition that needs to be addressed with it being the leading cause of death for both men and women. It is estimated that about 630,000 Americans die from heart disease each year8. Several studies have shown that periodontal disease is associated with heart disease. While a cause-and-effect relationship has not yet been proven, research has indicated that periodontal disease increases the risk of heart disease and can exacerbate existing heart conditions9. There are many factors that can affect one’s chances of having heart disease, one of those important factors being the C-reactive protein (CRP). C-reactive protein is a protein that appears in large quantities in the blood during infections to assist in the destruction or removal of invading microorganisms. Since periodontitis is a chronic infection, CRP levels can be elevated in those individuals with periodontal disease. In fact, many studies have found that CRP levels in patients with periodontitis are often above the critical level of three milligrams per liter and can be up to nine milligrams per liter, normal levels being less than three. Anything above three milligrams has been considered a risk predictor for atherosclerotic cardiovascular disease (ACVD)10. Dental professionals know that it is important for non-surgical periodontal therapy/SRP in periodontal patients because the process disrupts plaque and bacterial colonies. Using common devices for scaling and root planing like an ultrasonic also lyses the cell wall of bacteria. When implementing other bacterial reduction strategies like laser therapy, you have introduced even further bacterial reduction within the pockets. Data has shown that after completion of periodontal therapy, i.e., scaling and root planing, in patients with untreated periodontitis, there is a reduction of systemic CRP levels at three months and six months post-therapy2,3,11. Hence, the established and recommended recall for periodontal patients by most dental professionals. In summary, with diabetes being the seventh leading cause of death in the United States with approximately 7.2 million adults going undiagnosed12 and approximately 630,000 Americans who die each year from heart disease8, we cannot ignore any evidence which could reduce the numbers of deaths caused by these diseases. Evidence verifies that elevated levels of CRP are associated with a higher incidence of heart disease including acute thrombotic events, myocardial infarctions, as well as stroke and may even be linked to a chronic procoagulant state . The evidence also confirms that treatment of periodontitis results in an improved metabolic control of diabetes3. The next time you are thinking about missing your dental cleaning or ignoring your teeth, think about if you would ignore your body’s glycemic control or your heart health. Take care of your teeth, and they will take care of you. National Institute of Dental and Craniofacial Research. NIH Publication No. 13-1142 September 2013. Eke Pl, Dye BA, Wei L, et al. Prevalence of Periodontitis in adults in the United States: 2009 and 2010. J Dent Res. 2012; 91:914-920. P.M. Preshaw, A.L. Alba, D. Herrera et al., “Periodontitis and Diabetes: a two-way relationship,” Diabetologia, vol. 55, no. 1, pp. 21-31, 2012. M. E. Ryan, N. S. Ramamurthy, T. Sorsa, and L. M. Golub, “MMP-Mediated events in diabetes,” Annals of the New York Academy of Sciences, vol. 878, pp. 311-334, 1999. M. E. Ryan, O. Carnu, and A. Kamer, “The influence of diabetes on the periodontal tissues,” Journal of the American Dental Association, vol. 134, pp. 34S-40S, 2003. M. E. Ryan, A. Usman, N. S. Ramamurthy, L. M. Golub, and R. A. Greenwald, “Excessive matrix metalloproteinase activity in diabetes: Inhibitions by tetracycline analogues with zinc reactivity,” Current Medicinal Chemistry, vol. 8, no. 3, pp.305-316, 2001. G.W. Taylor, “The effects of periodontal treatment on diabetes,” Journal of the American Dental Association, vol. 134, pp. 41S-48S, 2003. Centers for Disease Control and Prevention, National Center for Health Statistics. Multiple Cause of Death 1999-2015 on CDC WONDER Online Database, released December 2016. Data are from the Multiple Cause of Death Files, 1999-2015, as compiled from data provided by the 57 vital statistics jurisdictions through the Vital Statics Cooperative Program. Accessed at http://wonder.cdc.gov/mcdicd10.html. American Academy of Periodontology. www.perio.org/consumer/gum-disease-and-heart-disease. Retrieved November 17, 2017. Paraskevas S, Huizinga JD, Loos BG. A systematic review and meta-analyses on C-reactive protein in relation to periodontitis. J Clin Periodontol. 2008; 35:277-290. D’ Aiuto F, Orlandi M, Gunsolley JC. Evidence that periodontal treatment improves biomarkers and CVD outcomes. J Clin Periodontol. 2013;40(Suppl 14):S85-S105. American Diabetes Association. 2017. www.diabetes.org/diabetes-basics/statistics. Retrieved November 17, 2017. Teeuw WJ, Slot DE, Susanto H, et al. Treatment of Periodontitis improves the atherosclerotic profile: a systemic review and meta-analysis. J Clin Periodontol.2014;41:70-79.